Diva Devotee: Taylor Swift is Currently Being DRAAAAAAAAAGED!!! Taylor Swift is Currently Being DRAAAAAAAAAGED!!! Karma has finally come-a-callin from Taylor Swift and her passive aggressive behind. While in a relationship with Calvin Harris, the Diva had helped the Scottish DJ pen the lyrics for one of his songs. Not wanting to overshadow the project, which Rihanna ended up guesting on, Taylor decided to credit the lyrics to the pseudonym Nils Sjoberg. Well. Mr. Harris, unlike her other beards partners, didn't like the implications of this, and had a little Twitter rant. And this is where the wider backlash began. 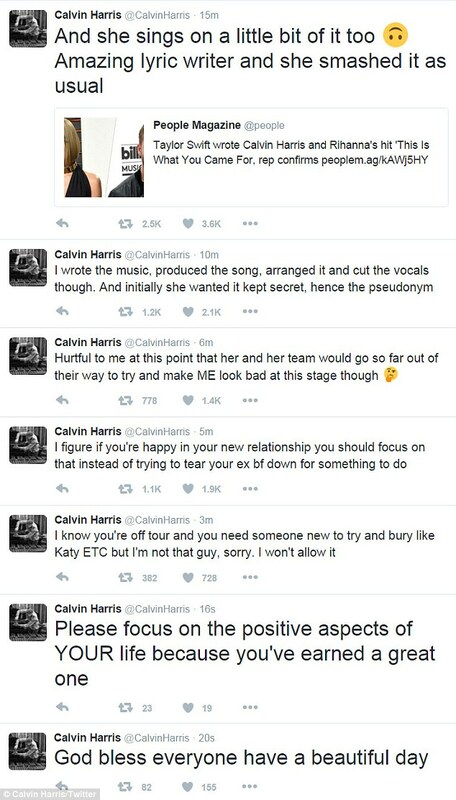 As if the first tweet- where the adjective "amazing" was used after her voice was mentioned- wasn't shady enough, Calvin went on to out and out confirm that the Bad Blood spat with Katy Perry wasn't just a fabrication of the media. Well the Twitter folk, who LIVVVVVVE for drama, saw blood and went in for the kill. Not only did Calvin Harris' fans get to hating, but so did those who support Katy Perry and Kanye West. If that wasn't a large enough segment of the Twitter-sphere, general haters and fandoms of the Diva's exes also joined the fray, resulting in #TaylorSwiftIsOverParty trending. So what we thinking: is Calvin being a manchild, or is Taylor reaping what she sowed?